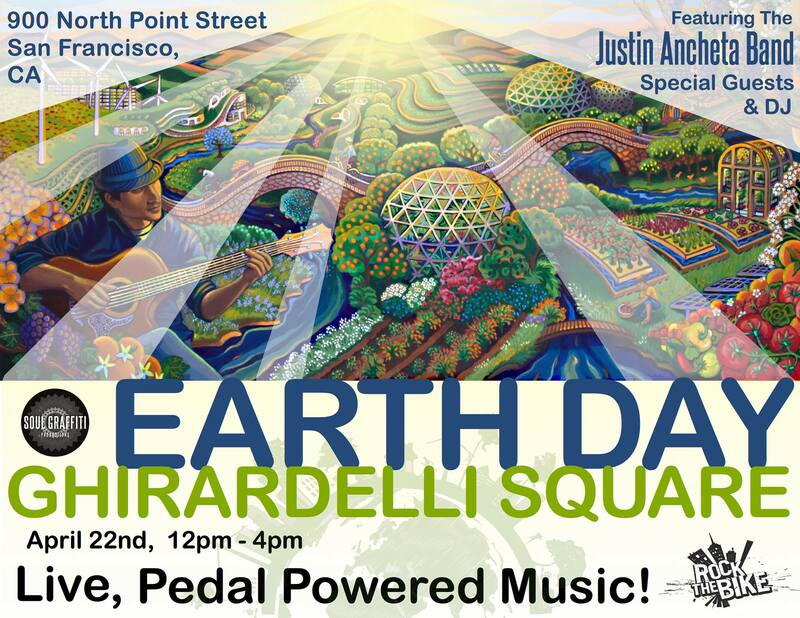 The Justin Ancheta Band is going to Rock The Bike at the Earth Day SF event at Ghirardelli Square from 12-4 pm on April 22nd, 2017. Coming back for the 2nd year in a row, Soul Graffiti Productions, and now also Rock the Bike are partnering to put on an Earth Day celebration at Ghirardelli Square. You will hear live performances of regionally acclaimed artists, featuring the Justin Ancheta Band, DJ Scratch, and special guests to-be-announced. The Justin Ancheta Band is a positively-charged, high-energy band from the Bay Area, California. They bring together world sounds with some heavy doses of funk and reggae. Lacing socially-conscious lyrics with horn, violin and guitar melodies over a steady foundation of drums, percussion, and bass, the band creates a dance party for everyone to enjoy. Tthey play venues such as the Independent, Slim’s, Yoshi’s, and the Great American Music Hall. Their tour schedule has taken them from Barcelona to Hawaii. After more than a decade of shows and touring, they have shared the stage with The Wailers, Joan Baez, Creedence Clearwater Survival, Charles Neville and many more musical luminaries. Earth Day has reached into its current status as the largest secular observance in the world, celebrated by more than a billion people every year, and a day of action that changes human behavior and provokes policy changes. Today, the fight for a clean environment continues with increasing urgency, as the reality of climate change becomes more apparent every day. We invite you to be a part of Earth Day and help write many more chapters—struggles and victories—into the Earth Day book, together! 2020 marks the 50th anniversary of the first Earth Day. In honor of this milestone, Earth Day Network is launching an ambitious set of goals to shape the future of 21st century environmentalism. At this event, the audience will be invited to use their own muscles to power the show together, experiencing how close we are to a clean energy future. “The environment needs a voice. We can be this voice through our energy and attention, finding ways to live within the means that support our natural environment. Earth Day is a day to celebrate this connection and each other”, says Ancheta from the Justin Ancheta Band. What you will find at this outdoor, family friendly event, is fun activities and games in a beautiful outdoor setting by the wharf. You will enjoy music, food, wine, and Ghirardelli’s famous chocolates. The purpose of this event is to inspire and celebrate as community and connect us to each other, the earth and a more sustainable path. Ghirardelli Square is located at 900 North Point Street at the corner of Beach and Larkin Streets. It is on the West side of Fisherman’s Wharf, two blocks east of Van Ness Avenue and one block west of the Cable Car turnaround at Beach and Hyde Streets. The bands activity has been recently focused on completing their own audio and video production studio called “Soul Graffiti Studios” in Oakland. The goal is to enable to band to offer a resource to the music community in the Bay Area tools that can uplift our scene of artists with creating an “Artist for Artist” collective Label. So far the success have been rolling out with producing shows that sometimes include JAB (Justin Ancheta Band), but offering shows and entertainment to the region, and farther out to nationally and internationally. Watch out for JAB and Soul Graffiti artists in your neighborhood. And look out for the upcoming audio and video we will be sharing monthly very soon.